Thought all hair brushes were made equal? Think again! There’s vented, barrel, paddle, styling and even tangle teasers – and that’s before we’ve thought about combs! Brushes of different shapes and sizes are used for different tasks. Vented brushes are used for blow drying hair. The carefully placed gaps and cut-outs in the head of the brush allows air from the hair dryer to flow around the hair strands, creating the desired blow-dried style. It doesn’t stop there though. Barrel brushes have vents in them too, and depending on what effect you want to achieve, dictates which size you need….. A small barrel will create volume as you blow-dry your hair whereas a large barrel will help control frizz. Paddle brushes are used to gently groom hair and to smooth it into ponytails. A cushioned paddle brush should be used for everyday grooming. 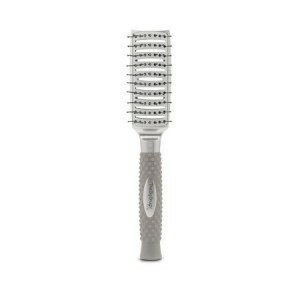 A paddle brush can also be used to rough dry thick, long hair into a straight style as it helps to remove moisture. A vent brush is best used to brush out curly hair. The generously spaced pins won’t snag curls and will gently loosen hair without damaging it. Stylist tip: use a paddle brush to create a perfectly straight fringe by alternating left and right strokes when blow-drying. At Taylor Hughes Hairdressing, we love The Big Brush Company! Made for professionals, they’re sturdy, robust and give perfect results everytime. We use them in the salon and sell them via our online shop. Choose from round barrel brushes, available in four sizes; 25mm, 33mm, 43mm and 53mm, the ionic large paddle brush or the classic vent brush. The materials used to makes these brushes are also important. The ionic element of the paddle brush helps reduce frizz due to its neutralising properties. It reduces static and smoothes hair with every stroke. The importance of a decent hair brush cannot be overstated. Whether you’re looking for a new brush for yourself or as a gift for a friend we recommend the The Big Brush Company range. Browse our online shop, order and pay online and opt for delivery or collect in the salon. If you have any questions concerning the right hair brush for you please call us on 01484 353 498 or email enquiries@haircarebyyorkshiresfinest.co.uk.